Your UCA password is active for 90 days before it expires. Follow the steps below to change your password yourself. NOTE: Make sure to change your password before your current one expires. If your current password has already expired and you are locked out of your account, contact the IST Help Desk. 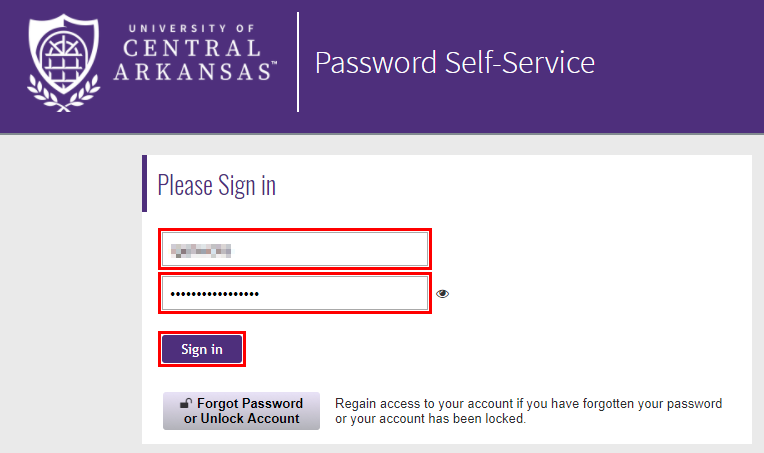 Go to UCA’s Password Self-Service at password.uca.edu. Enter your UCA username and password, and then click Sign in. If you have not logged into Password Self-Service before, the system will ask you to enter answers to security questions in the event that you forget your password; enter the answers to the questions if prompted, and then click Save Answers. Enter a new password, and then enter it again to confirm. Then click Change Password.